All-Pro Pest Control services is locally owned, and widely trusted member of the High Desert business community, proud to be one of the longest operating pest control and weed abatement companies in the area. Our technicians boast a vast amount of pest control experience, including: airliners, cruise ships, railroads, hotels/motels, even military installations. Let us know your pest control needs, and we’ll offer you suitable solutions at great prices! 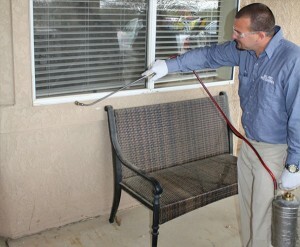 Our licensed and trained pest control experts will offer various treatment options to make your living or working environment a “pest-free” zone! Our promise: to be on time, on schedule, and on point! Call us to set up an appointment for more information. We a trained in weed abatement and spraying techniques that make our services more effective which will save you time and money in the long run.